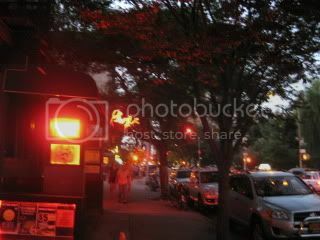 In the evening of the 2nd night (and the last night of this stay), I got together with an old friend of mine, who lives in the heart of East Village. She gave me a tour of her "hood" and we visited different places to eat and drink. 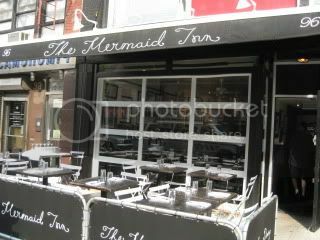 First stop was The Mer-Maid Inn, which was her recommendation for a happy hour stop. Super-fresh oysters on the half shells are only $1 each during their happy hour! 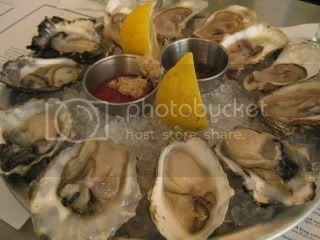 We tried oysters from both East Coast and West Coast with some rose wine by the glass. What a great kick-start of the evening. 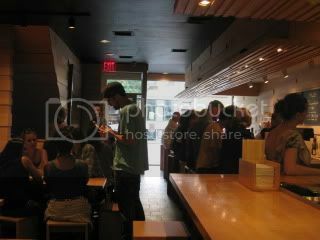 Then, we walked a few blocks to super popular Momofuku Noodle Bar. I expected there be a long waiting line for tables, but the restaurant was only half-filled when we got there. I thought maybe it was because less people were craving for hot noodles in the super hot evening of NYC. 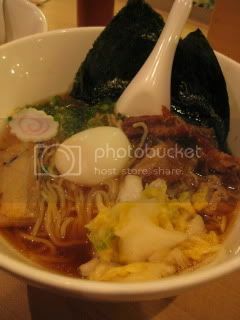 But, I normally enjoy sweating with a hot soupy dish in the summer, so it was perfect. 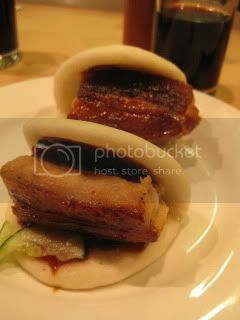 Pork belly buns were so juicy and extremely rich. 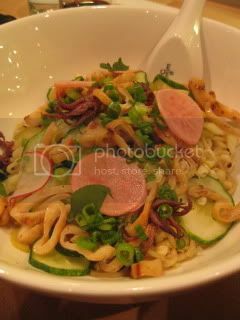 Momofuku noodles and cold grilled squid noodles. I was getting quite full. 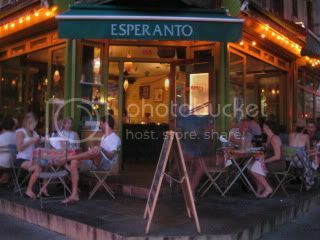 So, we walked to Esperanto, a popular Brazilian resto, for a refreshing cocktail. 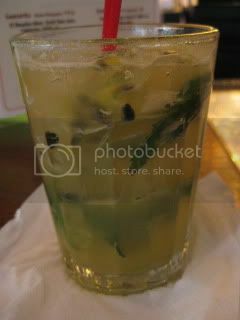 I had a nice rum cocktail with freshly-squeezed passion fruit. They have live music every night. 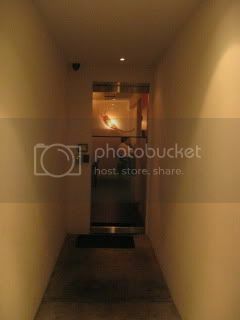 The last stop was Bohemian, which is hidden behind a premium beef butcher (Japan Premium Beef). 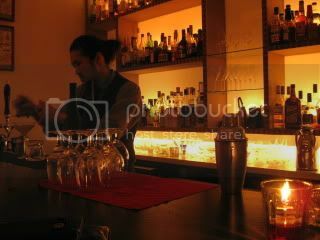 Bohemian is run by Japanese people and it has both dining and bar sections. 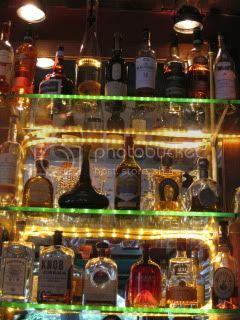 We sat at a bar and had some drinks. 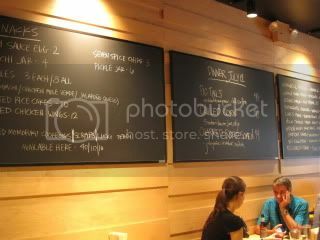 Their dining menu looked very interesting with special Washu Beef items and modern Japanese dishes (smelled so good!). 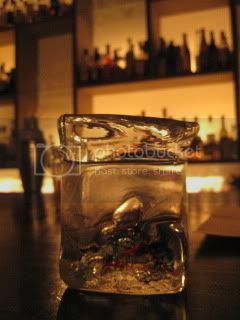 One of the cocktails my friend ordered had some super-thin cucumber, which was sliced with a truffle shaver. I admired their originality. She was willing to take me to more places, but I had to wake up 4 am the next day, so we called the night after Bohemian. But, I would love to come back for more adventures in East Village with her next time.